Home Uncategorized What is famous in Himachal Pradesh? Himachal Pradesh is a state in northeast India. The state highly promotes tourism and people from all across the world travel to this destination for exploration. This destination offers surreal landscapes and a beautiful climate which makes travelers add a visit here in their bucket lists. Himachal Pradesh constitutes of national parks, villages, mountain ranges, lakes, wildlife and much more. The state has a fusion of religion, history, art, and nature to offer to visitors. Christ church – An architectural beauty built in 1857. It is said that the designers took three long years for its completion. Many famous movie scenes were shot in this location. It is the biggest church in the subcontinent. Jakhoo Temple – The Jakhoo hill which is the highest peak in Shimla hosts the temple. The location is situated 8000 feet above sea level. People can plan a trek around their visit to the temple. It is however said that tourists need to be careful while trekking as many monkeys can be spotted in this location. They tend to rob the tourists for food. Devotees pay their respects to the 108 feet tall statue of Lord Hanuman installed in the temple. The place, as well as the temple, is dedicated to Lord Hanuman as a deity. The Mall Road – This is a popular tourist destination. If you want to explore Shimla in a nutshell, then visit this place. It will offer you all the items from A-Z which promote the culture of Shimla. As a tourist, you can also explore cafes, food joints and the heritage theatre that supports the culture of the place. Johnie’s Wax Museum – Shimla has a lot to offer in terms of entertainment. The museum was initiated in 2016 by MBM brothers. The sole purpose of having it was to install pictures of various Bollywood personalities. The museum already has 16 wax models different characters and celebrities across the world. The entry fee to this place is minimal. The museum offers tourists to get a wax replica of their hands done. Ride around by the toy train – These trains offer a special kind of excitement. They are available only in the Himalayan range and give a glimpse to the tourists of the essential destinations across. Though the tracks to this journey are rough, they provide an enthralling experience to the tourists. Shimla state museum – This place used to be an old Victorian mansion during the British era. It isn’t adapted as a museum. A part of it is the residence of Indian government officials, and another part is used to preserve bits and pieces of the heritage. 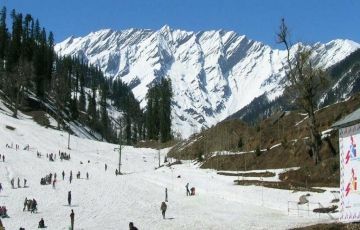 Find which season suits you the best to travel to Himachal Pradesh. Get an itinerary done and explore. Next articleWhen does Shimla receive snowfall?